This is an exciting time for our city. We will elect a new civic government in the 2018 Vancouver Municipal Election and I want to be part of the new government. I am running to become a Vision Vancouver Park Board Commissioner. I need your support to be elected on October 20th. I have been a resident of Vancouver since 2003. My family has operated a hardware and lumber business in the city for over 40 years. I am a lawyer, mediator and small business owner. Over the past 7 years, I also served as a Director of the West Point Grey Community Association (WPGCA), a charitable organization. WPGCA operates the West Point Grey Community Centre jointly with the Vancouver Board of Parks and Recreation (Park Board). Over the past 2.5 years, I was honoured to also serve as the WPGCA President. The WPGCA is part of a network of 23 Community Centre Associations that operate 23 Community Centres across Vancouver in collaboration with the Park Board. Through my volunteer work with the WPGCA, I have come to deeply value the central role of community organizations and spaces in connecting residents and building our communities. I want to put my experience to work as your Park Board Commissioner. I believe it is important that a Park Board Commissioner have experience in the Community Centre Association Network. Community Centres are immensely valuable to our neighbourhoods because they deliver recreation services to thousands of Vancouver residents. At the WPGCA, I worked hard to ensure the culture and services fostered inclusion, equity and respect for different perspectives as we served over 10,000 registrants annually at our Community Centre. I am passionate about community participation in government decision-making. Working together, we make better decisions. Active and meaningful engagement of community organizations and residents to help inform Park Board policies and decision-making. Equitable and affordable access to recreation facilities by all residents of Vancouver. Increased investment in community and cultural spaces, and support for community initiatives across Vancouver. For details, click on “My priorities” tab at the top of this page. 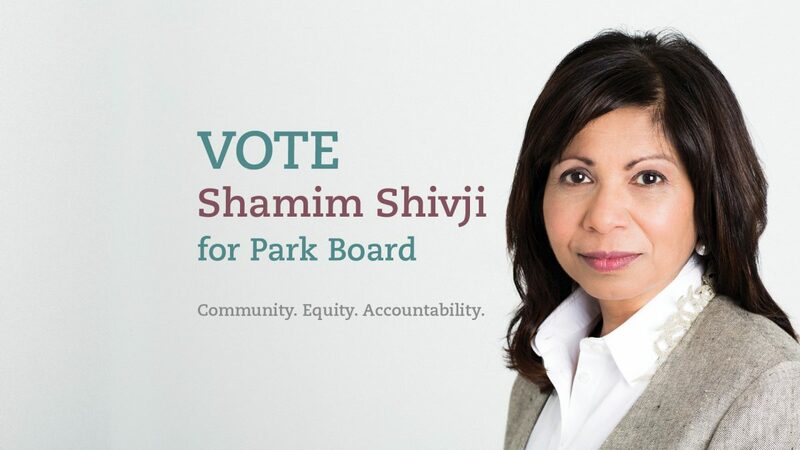 If there are other ways in which you believe we can make our city stronger through policies and decisions of the Park Board, or if you have other priorities you wish to share with me, please email me at: shamimshivji2018@gmail.com. I am also happy to meet with you in person to discuss Park Board issues. Recipient of the 2018 Vancouver Quadra Hidden Heroes award for Community Service.